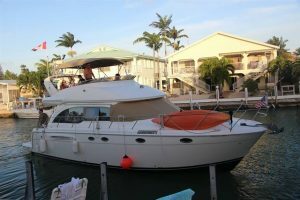 Check out this used 46' Meridian yacht for sale in the Florida Keys! : Atlantic Yacht & Ship, Inc. Check out this great deal on an used 46′ Meridian yacht for sale offered by Bill Leonard! In the first place, this used 46′ Meridian is a new arrival in great condition and motivated to sell. Moreover, this yacht has everything you want. You will love how she is powered with twin Mercruiser engines that allow her to cruise at 25 knots. Together with her generator you will enjoy all the comforts of home. Overall, this used 46′ Meridian has been lightly used and will take your family on memorable island adventures! Furthermore, you will love the quality to price ratio for this used 46′ Meridian. A large swim platform leads to an equally large cockpit. These areas are suitable for both fishing and entertaining. A convertible dinette in the saloon give you flexibility for accommodating friends. Two large main staterooms with queen beds and private bath rooms provide for the main accommodations. Together with the comfortable saloon and well-provisioned galley you are good-to-go! For more information on this beautiful used 46′ Meridian yacht be sure to contact Bill Leonard today!